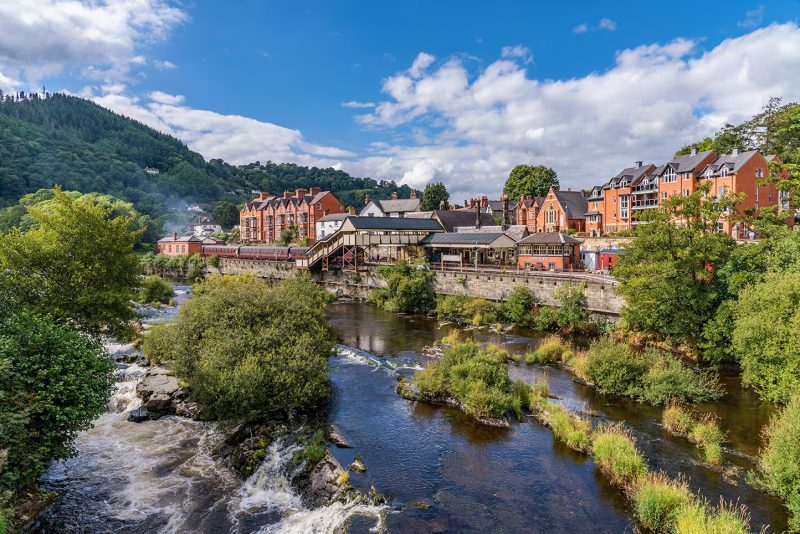 Whether it’s for a weekend away, a family day out or you just fancy playing tourist for a day in your own town, there’s plenty to do in Llangollen. Dave Rothnie Reports. Llangollen is small town of 3,000 people in Denbighshire but it is big on charm and has something for everyone. The pulsating River Dee quickens the soul and its bubbling energy is felt throughout the town, which is a bustling hub of arts and entertainment, cafés, restaurants, shops and bars, all wrapped in an air of legend and tradition. The town is best known for hosting the Llangollen International Musical Eisteddfod which takes place every July which brings in some 120,000 visitors and turns the town into a vibrant international stage. This is a well-spring of creativity which underpins the town’s burgeoning arts scene, but it only scratches the surface of Llangollen which all year round offers an eclectic and often surprising mix of picturesque walks along Unesco world heritage site, adrenaline-fuelled water sports, the only standard gauge railway in North Wales and a wealth of bars, cafés and restaurants to suit every palate. And its compact size makes it easy to navigate whether for a pushchair-friendly stroll along the canal, or an afternoon shopping in the town’s rich array of independent boutique shops. A favourite walk is the town side of the bridge stroll along Dee Lane and Victoria Promenade to Riverside Walk. This passes gardens with views of the steam trains, ducks, a bandstand, tennis courts, bowling green and children’s play area. For a more challenging walk, the remains of Castell Dinas Bran (Crow Castle) seen high on an isolated hill above Llangollen and reached by a steep climb. From the top the views of Llangollen and the Dee Valley are stunning. Llangollen was established in the 7th Century when the monk St. Collen, from which the town takes its name, was instructed to find a valley by riding a horse for one day and then stop and mark out a “parish” – a place to build his hermitage or cell in the custom of the times, with tiny church, hospice and outhouses all enclosed within a wall. The famous Dee Bridge was built in the 16th century to replace a previous bridge created in 1345 by John Trevor, of Trevor Hall (later Bishop of St Asaph), which replaced an even earlier bridge which was believed to have been built in the reign of King Henry I. In the 1860’s the bridge that we know today was extended by adding an extra arch to cross the new railway and a two-storey stone tower which featured a castellated parapet. This became a café before being demolished in the 1930’s to improve traffic flow. Up to the I9th Century Llangollen town was located south-east of the bridge around Bridge Street and Church Street, and to the north-west around the old village green, which has now disappeared, but is remembered by such names as ‘Green Lane; and ‘Green Lodge’ which still exist. Nearly all of this densely populated area disappeared to allow the building of the Ruabon to Barmouth railway in 1862. Many objected to this noisy new Flannel Mill, not least Lady Eleanor Butler and the Honourable Sarah Ponsonby, known as the world-famous ‘Ladies of Llangollen’ who looked upon `this monstrous building’ with contempt from their home Plas Newydd. During this time Plas Newydd was visited by many of the famous and distinguished of the time, although only the favoured were allowed admission. Today the house receives thousands of visitors each year as one of Wales’ most famous tourist attractions, while the old mill is now a riverside pub offering real ales and sumptuous food with fine views. The Railway closed to passenger traffic in 1965, and to goods in 1968 but steam trains continue to puff through the station thanks to the efforts of the Llangollen Railway Society.A group was formed to renovate and reopen part of the line in September 1975, with just 60 feet of track which has now grown some 7½ miles along the Dee Valley passing wonderful scenery and giving a glimpse of how this 65-mile journey must have looked like in its heyday. The only standard gauge railway in North Wales now huffs and puffs for almost ten miles through the stunning Dee Valley, an Area of Outstanding Natural Beauty. It also offers Thomas the Tank Engine rides for the younger rail enthusiast. Whether for a family day out, an evening’s entertainment or a weekend enjoying the plethora of attractions, Llangollen is a North Wales gem.